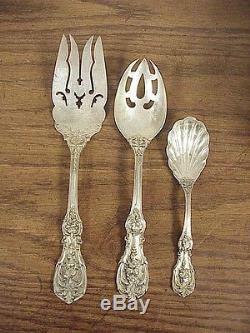 63 Pieces of Reed & Barton "Francis I" Sterling Silver Flatware. 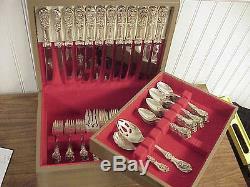 Lovely sixty three piece set of sterling silver flatware Reed & Barton Silversmith's 1907 Francis I pattern with wood storage chest. 12 hollow sterling handle dinner knives with "modern" style stainless steel blades 9 5/8 inches long 12 dinner forks 7 7/8 inches long, total weight is 30.85ozt. 12 salad forks 6 1/8 inches long, total weight is 14.80ozt. 12 oval bowl soup spoons 6 3/4 inches long, total weight is 19.24ozt. 12 tea spoons 5 15/16 inches long, total weight is 3.92ozt. 1 cold meat fork 9 1/4 inches long, total weight 3.90ozt. 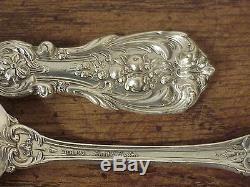 1 pierced table / serving spoon 8 3/8 inches long, total weight 2.80ozt. 1 sugar shell spoon 6 1/4 inches long, total weight 1.34ozt. The set is in very good condition, not worn, not bent, no dents, no monograms. Pieces are marked "Sterling Reed & Barton" on the backs of the handles. 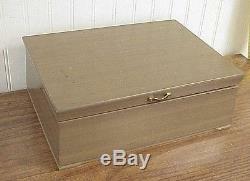 Felt lined wood storage / display case is in good condition, outside has a few scuffs and scratches. Total Weight-able silver 86.85ozt. (UPS Ground) so you can be sure your item(s) will arrive safely and efficiently. We are licensed and bonded members of The American Society of Appraisers and Triple A Rated members of The Better Business Bureau. 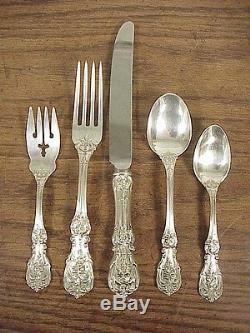 The item "Reed & Barton Francis I Dinner Size Sterling Silver Flatware Set & Case 63pc" is in sale since Thursday, January 17, 2013. This item is in the category "Antiques\Silver\Sterling Silver (.